Fiji, Vanuatu, Tahiti, Palau, Tonga, Samoa… Just hearing the names of those islands conjures up travel brochure images of a warm tropical sun setting in the distance over blue turquoise waters, palm trees, secluded white sandy beaches, and air conditioned hotels calling to your inner most desires. As real and appealing as those images may be, there is another calling in the South Pacific that few hear or know about. It's an urgent call for help. "Although the islands nations were striving to build a modern infrastructure on their larger, more populated primary islands, there was no service delivery mechanism in place, or funds available to try and connect their hundreds of remote islands to even the most basic services. That was when we learned the reality of the situation there." Richard and Stephanie understood that the need was urgent and knew that with the right relationships in place with the government ministries, an organization could stand in the gap to meet those remote island needs. In 2012, they launched a non-profit organization called Sea Mercy, a fleet of "free" Floating Health Care Clinics staffed by international based health care volunteers who were willing to answer that call for help. 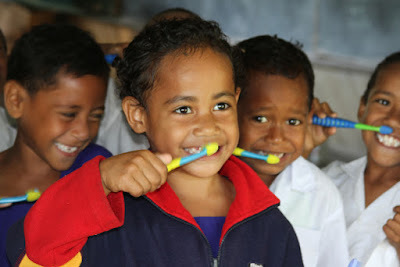 Working under Memorandum of Understandings with their island nation partners (currently Tonga and Fiji), since 2013 they have visited over 150 remote islands, evaluated and treated over 11,500 medical patients, tested and provided over 4,500 reading glasses, and treated over 1,500 dental patients. Sea Mercy thinks creatively with achieving the end goal in mind. https://www.facebook.com/447842518601871/videos/968738943178890/ shows that when you really need something, there is always a way to get it. When two desperately needed water tanks were loaded and offloaded onto Lil Explorers during disaster relief work in Vanuatu, the remote islanders were very excited to have their new water tanks. In 2014 following Cyclone Ian in Tonga, and in 2015 following Cyclone Pam in Vanuatu, Sea Mercy sent eight vessels to deliver aid and medical care to the devastated remote islands there. In October 2015, they launched their First Response Fleet program to better serve those in need on the remote islands following a natural disaster. In April 2016, they plan to send out their Global Mercy Armada www.seamercy.org/armada to the remote Lau Group in Fiji. A program designed to train and assist the remote islands not only to be self-sustaining and survive, but to thrive economically. With nine more island nations on their target list for these programs (and 1,800 remote islands), they are looking for Rotarians and Rotary clubs who have the same heart for the people in the South Pacific and willing to answer their call for help. Whether it is to join a medical mission rotation, assisting with disaster response needs, or offering your talents and abilities for the Global Mercy Armada, we encourage you to contact Sea Mercy: Sailing with a greater purpose and help make a difference. For more information, contact Richard via email info@seamercy.org. Note that this is not a Rotary project or specifically endorsed by Rotary.